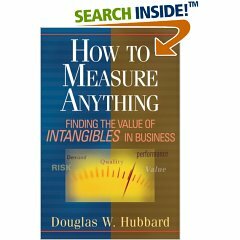 Book Review: Part I; How to Measure Anything by Douglas W. Hubbard : Executive Leader Coach @ dbkAssociates, Inc.
Book Review – Part I: How to Measure Anything; Finding the value of intangibles in business. Many times throughout my career, I’ve been confronted with the difficulty of presenting a business case for one project or another to colleagues or management. I suspect many of you have had similar experiences. Perhaps the most frequent reason for failing to win approval of “my project,” was that I had not made a sound, measurable business case. Come to think of it, I have yet to have a project turned down by the management team or board when I properly demonstrated that it met ROI and strategic objectives. So the question is how do we make a sound, measurable business case for our projects? How do we measure risk with some of our more “soft” project components such as advertising and marketing results, new product initiatives or, for example, simply evaluating whether to hire additional sales people to grow market share? Enter Douglas Hubbard, author of How to Measure Anything. Hubbard has made what can be a deadly dull subject interesting and accessible. He writes in a clear and concise manner and uses many real-life examples to make his concepts “stick.” I wish I had access to the concepts in this book decades ago as I built my career in the semiconductor business. How much do you know now — what ranges or probabilities represent your uncertainty about this? What is the value of the information? What are the consequences of being wrong and the chance of being wrong, and what, if any, measurement effort would be justified? Within a cost justified by the information value, which observations would confirm or eliminate different possibilities? For each possible scenario, what is the simplest thing we should see if that scenario were true? How do you conduct the measurement that accounts for various types of avoidable errors (again, where the cost is less than the value of the information)? I especially enjoy the approach Hubbard takes to quantify the cost of making measurement based on the value of the information obtained. Too often, I have seen projects founder on either the inaction to get data which would be of great value and little cost or, perhaps, the exact opposite — spending great amounts of time and money to obtain relatively useless information. Key to putting the concepts in this text to work in your organization is to make sure that your team is “calibrated” for range estimates. I found that what Hubbard points out with respect to getting folks to “commit to a number” is true – they won’t if they can possibly avoid it. But getting them to sign up for a range of numbers is easier. Ranges such as sales will increase between $3 million and $5 million if we put a qualified new person in the field; the additional cost will be between $80 K and $100K for that person; gross margin should be between 45% and 50% are easier to think about. Yet, they present a problem since we are not at all sure how confident our team is in these numbers. Hence, calibration! Hubbard takes a great deal of time and care in providing the reader with an explanation of why we need to calibrate our team, what the goal is (90% confidence levels in the ranges we give) and the tools to help us in training our team to become expert in developing 90% confidence levels in the ranges for variables in our case models. Appendices in the book provide surveys for our use in getting across the idea of developing ranges. A “final test” I enjoy and now often use is to imagine a “wheel-of-fortune” type wheel with 9-10ths (90%) of the surface area covered in a color representing “You win $1,000.” The remaining 10% of the wheel is “You win $0.” Now, play the game – would you rather accept a bet on winning $1,000 if the increased sales actually come within the range you gave or would you rather “spin the wheel”? The only correct answer for a properly calibrated range estimate is “it doesn’t matter” because I have a 90% chance of winning either way. As a companion to this very well written book, there is a web site that provides additional information and examples. How to Measure Anything should definitely be on every business owner’s and manager’s desk. Go to Part II of this review – Monte Carlo Sample. Click to see on Amazon web site.